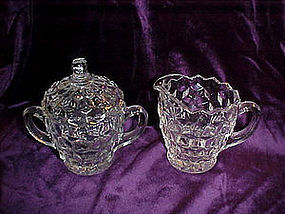 Fostoria american creamer & covered sugar.This is the full size set. Creamer measuring about 4" tall, and the sugar measuring about 5" tall with lid on. This is a perfect set! So pretty it sparkles. No chips or blemishes of any kind visible to me. 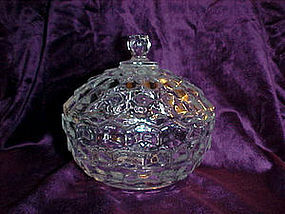 Fostoria american pattern covered candy dish.5 1/2" in diameter, and measures approx 5 1/4" tall with the cover on. This is a pretty addition to your collection. No nicks, chips or cracks. Extremely nice condition. If you miss this one, I have another availiable. 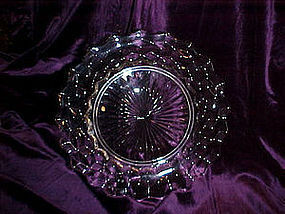 Fostoria american 8 1/4" salad plates with large center. I have 2 available. Condition is excellent on both. Irish Mist man, decanter. Stands 18 3/4" tall. 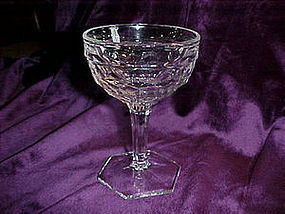 Front base of man states "IRISH MIST" Irelands legendary liqueur. According to the estate information this would probably be from the 1950's - 1960's era. The paint is strikingly vivid. The gold trim is very bright and shiny. His cork is intact and he is in perfect condition. 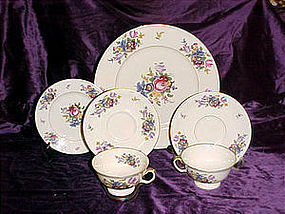 Large raised numbers in the porcelin 077 have the glaze over them. A very handsome advertising decanter. 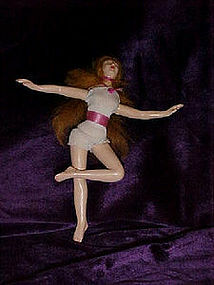 This is an all composition ballerina. She is only 5 3/4" tall! Beautiful condition,original clothes too. Her hair is thick and long,and appears to have never been out of the tie. Her legs and arms are held together with rubber bands. Her arms and legs are shaped as you see them in the picture. She has no ID marks that I can see, but have not had her clothing off. 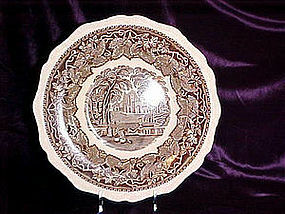 The composition is in fantastic condition. Nobody I know has ever seen one of these. A very unique addition for any doll collector. Kerr& Hinz 4" baby doll. Mint condition in box. 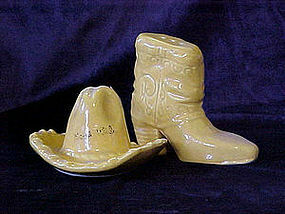 These are in the sweetheart line, manufactured in Santa Clara,Ca. They are made of the unglazed porcelin (like the storybook dolls). 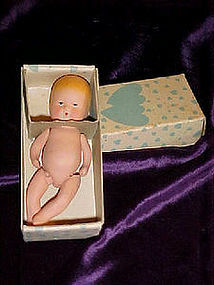 Actually this looks exactly like the Nancy Ann baby. The little box is covered with blue hearts. I suppose he's a boy! I have 3 availiable. 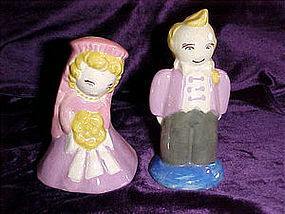 This is the most adorable matched bride & groom in pottery.The pottery has a glazed finish, and the colors are soft. He stands at 4", her at 3 1/4". Possibly they were toppers for a wedding cake. I'm not sure of the maker, but are sure they're old. Wonderful condition. Sold as a pair only. 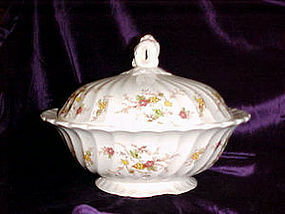 Beautiful Myott Heritage covered casserole. Made in England. 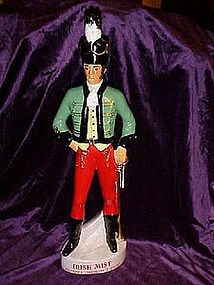 With cover on, measures 7" tall. Rim to rim measurement is 9 1/4". Swirl in the ceramic decorated with delicate little flowers in browns and yellows. 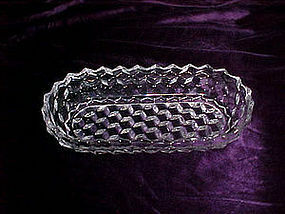 A nice open style finial tops off the lid of the dish. No nicks, chips, cracks or crazing to this piece. It is a definate asset to your set. 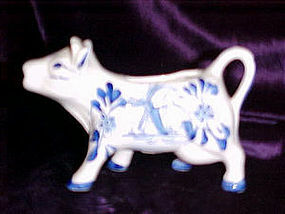 Cute delft style cow creamer. No markings. 5 3/4" long, and 3 1/2" tall. Handle is the tail, and pours out the mouth. 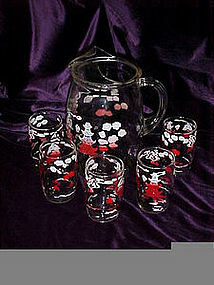 A cute collectible or use it for your moo juice! Very nice condition. No nicks cracks or chips. Ceramic bell appears to be old, due to some crazing. I believe she is a bride, as she holds a boquet of flowers in front of her. She has a green spatter effect to her dress. 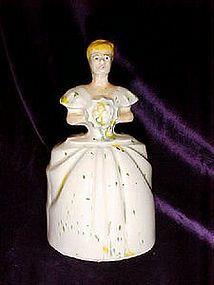 She is approx 5 3/4" tall, and still has her clapper, which is unfired ceramic. 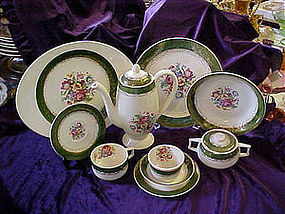 She is in pretty good condition,other than the minor cracks under the glaze which was due to it originally being made. A real cute addition for a bell collector, just not sure of the age.